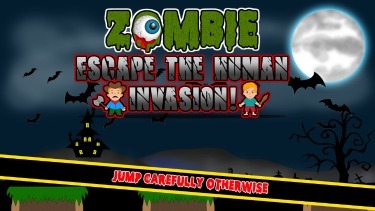 Download Zombie Escape the Human Invasion Today! The humans have fought back! In a world once overrun by zombies, the hunter becomes the hunted! Now, the zombies have to run away from humans! 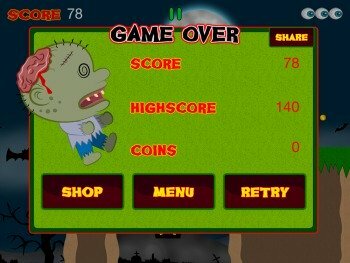 Zombie Escape The Human Invasion is a game with a new twist of endless running, breathtaking adventure, and horrifying sceneries that you will surely love! Eerie, freaky flying bats everywhere? We have them! Those dead trees that looks like a giant monster’s hand? We’ll never let you sleep! Cute zombie-hunting humans that should never ever be underestimated? No, they will not save you, for they will hunt you! You will be controlling Milton, once a proud member of the mighty horde of flesh-eating brain-consuming zombies! Once the world was controlled peacefully by zombies, eating the brains of yummy humans, keeping the world spooky and dark and full of horrors. The darkness of the world was Milton’s heaven, a place full of wonderful terrors, where humans can never fight them. But alas, the humans have fought back, their brains have started working again! They have regrouped and decided to chase all the zombies and bury them back to the ground! The prey now becomes the predator. The hunter becomes the hunted. Now, you and Milton are alone in this world, running tirelessly and endlessly in a world now overrun by humans. Will you be able to save Milton from the zombie-hunting humans? Jump! As the humans will block you along the way! Dodge! As the humans try to reach for your head! Power-up! As the humans try to stop you on your tracks! Jump some more! As the world is filled with gaps and traps that will make the game more challenging! Run as fast as you can, and as long as you can! 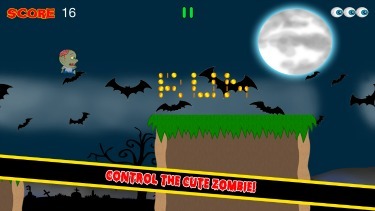 Collect coins and power-ups along the way, while dodging those pesky humans! Double your score through power-ups! Collect more lives to survive against humans! 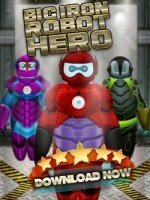 Pick-up the invincibility power-up and walk through past human armies without a scratch! Upgrade Milton’s power-ups by collecting coins! Open our shop and purchase upgrades for double the score, more health and longer lasting power-ups. Can Milton finally outrun the the pesky humans? Or will he be brought back to the earth unto his eternal slumber? Fight destiny! Run away from the humans! Getting tired of running? No! You are a zombie! Zombies never get tired of running! Ever! Running out of coins? We’ll surely help you out! Visit the game shop for in-app purchases that will help Milton boost his speed to success! Got a high score? Share it on Facebook and Twitter! Let your friends know how awesome you avoid the humans! 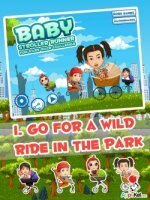 - In-app purchases available for coins and upgrades!.